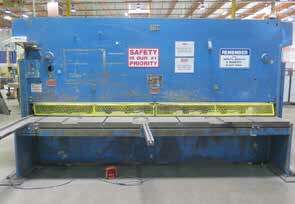 Chicago HPB11040 120 Ton x 13’ CNC Hydraulic Press Brake s/n 324496T w/ Chicago SB-230- A CNC Controls, 158” (13’2”) Bed Length, 12” Throat, 136” Between Uprights. HTC 250-12A ¼”/10GA x 12’ Hydraulic Power Shear s/n A1274848 w/ Power Back Gage System, 52”Squaring Arm, Front Supports. MiltiCam 5000 Series CNC Router s/n 5-305- 12-PF05463 w/ MultiCam HMI 20 Pendant Controls, 12-Station ATC, Taper Spindle, 24,000-32,000 RPM Spindle, 80” x 147” Table, MultiCam mdl. TV425 TurboVac Vacuum System. 2008 Computerized Cutters, Inc. “ACCU-BEND” mdl. 410 Automated Letter Bender s/n 0107-582-0308K w/ Windows Based Controls, Neon Wizard 6 / Sign Wizard 6 Software, Feed Table, Straightener Assy,Notcher, Bender Assy, Cutter. 2010 Piranha P-90 90-Ton Iron Worker s/m P90-2012 w/ 1 1/8” thru 1” Punch Cap., 1” x 12” – ¾” x 18” – ½” x 20” Straight Shear Cap., 6” x 6” x 5/8” Angle Shear, 2” Round – 1 3/8” Square Bar Shear Cap., 4” x 6” x 3/8” Coper / Notcher, 12” Press Brake Attachment. Piranha P50 50-Ton Iron Worker w/ 1 1/16” thru ½” – 13/16” thru ¾” Punch Cap., 1” x 4” – ¾” x 10”, 5/8” x 15” Straight Shear Cap., 5” x 5” x 3/8” Angle Shear Cap., 1 ½” Round – 1” Square Bar Shear Cap., 2 ¾” x 4” x ¼” Coper / Notcher. 2007 Baileigh AF-B Type 226 8 5/8” x 8 5/8” Power Corner Notcher s/n C3285 w/ Fence. Dayton mdl. 4YG34 52” Foot Shear w/ Manual Back Gage, Front Supports. Dayton mdl. 4YG33 48” Finger Brake. Rogers Mfg No. 20 C-Frame Mechanical Press s/n R-20- 164 w/ 10 ½” Throat, Roll Stand. Chief Enterprises “Letterlok 4000” mdl. LL4000 Norlok Riveter s/n 07033 w/ 25” Throat, Cap .090” =.063” Aluminum, 48” x 144” Table. Ruoff Power Notcher s/n 4704B. 2007 Elumatec Type DG142/02 Double Up-Acting Miter Saw s/n 1429130873 w/ Elumatec Controls, Pneumatic Clamping and Feeds, 6.5 Meter (255.9”) Length Cap, Roller Center Support. Hendrick mdl. HPS126 11’ Horizontal Panel Saw s/n 29638 w/ 92” x 126” Table, Pneumatic Hold Downs, 5Hp Motor, Dual Bag Dust Collector. W.F.Wells mdl. L-10 10” Horizontal Band Saw s/n L071384 w/ Manual Clamping, Coolant, Conveyors. DoAll mdl. 3613-V3 36” Vertical Band Saw s/n 568-08138 w/ 30-5500 Dial FPM, 26” x 26” Table. 2007 Pioneer mdl. PNR10-170 16” Vertical Band Saw s/n 07100109 w/ 17” x 17” Table. 2008 Delta ‘Unisaw” mdl. 36-L31X Table Saw s/n 08B11269 w/ 27” x 84” Extended Table, Blade Guard. Paint and Support : (2) Future Cure mdl. 2000 RDD Automotive Type Paint Booths w/ 15’10”W x 32’6”L x 12’11”H, 1,500,000 BTU Gas Fired Heater, (2) 36” x 180” Filters, 3Hp Exhaust Fan, Lights, Folding Double Doors. Graco ProMix II Electronic Component Proportioner s/nAO389 w/ EasyWay PLC Controls. Import mdl. G0521 Drilling / Tapping Machine w/ 1” Max Drill – 7/8” Max Tap Diameters, 190-2250 RPM. Ryobi Bench Model Drill Press w/ Rolling Bench. Kufo-Seco mdl. UFO-102B Dual Bag Dust Collector. (2) Jet mdl. DC-650A Bag Style Dust Collectors. (2) Miller Millermatic 252 Wire Welders s/n’s LJ140076B, LH480470B. (2) OTC Daiher “MIG 135” mdl. CPSS-135 MIG Welders w/ Spool Guns. Miller Thunderbolt XL 225/150 Amp CC-AC/DC Arc welding Power Source s/n LH431128Y (BENT CASE). Miller Spectrum 1000 DC Plasma Cutting System with Auto-Line s/n LJ190319P w/ Cart. 48” x 52” Welding Table. Graphtec Cutting PRO FC7000 MK2-160 6’ Vinyl Cutter. Graphtec Cutting PRO FC7000 MK2-130 5’ Vinyl Cutter. Gerber enVision Vinyl Cutter Plotter s/n E15801003. GSPFTP3 Thermal Printer s/n F010804001. Toyota 7FGCU35 6430 Lb Cap LPG Forklift s/n 60329 w/ 3-Stage Mast, 199” Lift Height, Side Shift, Cushion Tires, 12,631 Hours. Toyota 5FBE18 3230 Lb Cap Electric Forklift s/n 21440 w/3-Stage Mast, Side Shift, Solid Tires, Charger. Vertical and Horizontal Sheet Stock Racks. (7) Sections of Pallet Racking. Assemble Tables 60” x 288”, (2) 54” x 112”, (2) 52” x 100”, 56” x 96”. Conference Table w/ (8) Chairs.